What pet friendly ski vacation promises world-class mountains, sparkling sun, brilliant blue skies, and amazing winter activities? A Northern New Mexico Ski Country vacation, of course! From champagne powder skiing to high-altitude golf (balls travel 10% farther!) to myriad opportunities for exploring the region's rich historical and cultural attractions, Northern New Mexico Ski Country is truly a pet owner's dream vacation destination. Located an easy drive from Albuquerque to the south and Denver to the north, Northern New Mexico Ski Country lies at the southern end of the magnificent Rocky Mountains. 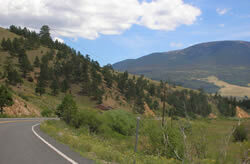 The legendary Sangre de Cristo Mountains, Jemez Mountains, and San Juan Mountains dominate this region. Named for the fiery red winter sunrises and sunsets that illuminate its snow-capped mountain peaks, the Sangre de Cristo range--whose English translation means "Blood of Christ"--is home to most of New Mexico's ski areas, including Angel Fire Resort, Taos Ski Valley, Red River Ski Area, "Sipapu Ski and Summer Resort, and Ski Santa Fe. 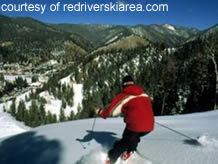 Another ski area, Pajarito Mountain, is situated on the east slopes of the Jemez Mountains near Los Alamos. A pet friendly Northern New Mexico ski vacation has no equal in the lower 48 states. Unlike other high-priced, crowded ski resorts, the region's ski areas combine affordability and accessibility with small crowds and epic, deep powder snow. The extraordinary sunny, dry weather is perfect for morning skiing on snow-covered mountains in the upper elevations; an afternoon golf game in the mountain foothills, and an early evening hike with Fido through the picturesque high desert, all in the same day! Visitors in this pet friendly area will have no problem finding an experienced pet sitter, dog walker, or doggie daycare provider for dependable pet care while they hit the slopes or the links. Whether you're a novice skier or an experienced pro, there's something for everyone in Northern New Mexico Ski Country. Families will appreciate the laid-back, relaxed atmosphere at Sipapu, Red River, and Pajarito Mountain ski areas, while skiers and snowboarders alike will relish the excellent variety of terrain at Angel Fire Resort. Exciting Taos Ski Valley features not only a top-ranked ski school, but it also boasts some of the most difficult, unspoiled ski terrain in the country. 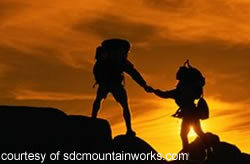 Ski Santa Fe, with a base elevation of 10,350 feet, is one of the highest ski areas in the continental United States. Its dramatic mountain vistas are the backdrop for thrilling steep bump runs, powder filled chutes, and gladed tree skiing. After a challenging day of skiing, what could be better than heading back to your vacation rental and snuggling with your pet in front of a roaring fire? Other exhilarating winter activities in the area include snowtubing, snowmobiling, dog sledding, ice skating, ice fishing, snowshoeing, and cross country skiing. At pet friendly Enchanted Forest Cross Country Ski Area in Red River, your unleashed dog under voice control is welcome on a three-mile-long groomed trail. 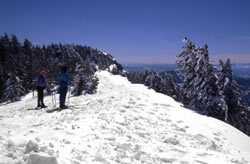 Here, cross country skiers will enjoy spectacular scenery while Fido romps in fluffy, dry snow. Dogs are also welcome on numerous lower-elevation hiking trails in the 1.6-million-acre Santa Fe National Forest, many of which wind through lush meadows, conifer forests, and even a dormant volcano. Snow is possible on many of these trails in the winter months, so be sure to check local conditions before heading out. Pet friendly accommodations in Northern New Mexico Ski Country include rustic campgrounds and RV parks, budget-friendly motels, full-service hotels, charming bed and breakfasts, rustic lodges, and luxury home rentals. For visitors who want to be as close as possible to the slopes, pet friendly Angel Fire Resort allows dogs in its spacious hotel rooms. Pet friendly restaurants are also plentiful in the region, offering everything from regional fare to sushi bars to award-winning fine dining. Be sure to sample the delicious New Mexican cuisine, which combines Native American, Spanish, and Mexican influences and features the piquant green chile pepper. Many popular restaurants like the Guadalupe Cafe in Santa Fe and the Alley Cantina in Taos welcome well-behaved, leashed pets on their charming outdoor patios. When visiting pet friendly Northern New Mexico Ski Country, find time to explore the fascinating historical and cultural attractions in the area. 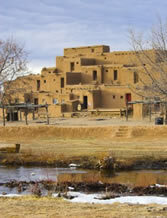 For an inspirational driving day trip from Santa Fe to Taos, load Fido in the car and take the High Road to Taos Scenic Byway (www.newmexico.org). This lovely, winding road travels through centuries-old Spanish and Pueblo villages and offers magnificent vistas of snow-capped peaks. At the conclusion of your drive, you'll find yourself in Taos, a remote and resplendent town that has long been a haven for artists and bohemians. Exceptional art galleries, notable museums, historic adobe buildings, funky boutiques, and numerous pet friendly restaurants make Taos a great place to visit and explore with your pet. Taos is both the starting and endpoint for another popular driving tour, the National Forest Scenic Byway or the "Enchanted Circle." 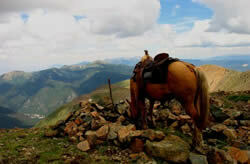 This spectacular drive encircles Wheeler Peak, the highest mountain in New Mexico at 13,161 feet. In addition to stunning alpine vistas, travelers will marvel at ancient rock formations of quartz and feldspar that date back two billion years. Be sure to take a break in some of the charming towns on the tour, including the old mining boomtown of Red River. Another must-see is the ghost town of Elizabethtown, where you and your pet can take a solitary walk through the haunting remains of a once-booming mining community. 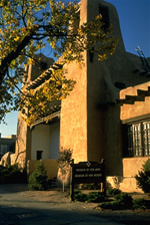 After a driving tour of the area, visitors should plan to spend a relaxing, fun-filled day in the state capital of Santa Fe. This cosmopolitan city offers world-famous art galleries, an impressive number of museums, a nationally renowned opera house, and a unique southwestern shopping experience. Your leashed pet is welcome to accompany you on a Historic Walking Tour of Santa Fe, where you'll gain insight and understanding of the city's colorful history and culture. Afterwards, grab a bite to eat at one of the many pet friendly restaurants in the city. Other interesting towns to explore in Northern New Mexico include Angel Fire, Questa, Los Alamos, Chama, and Espanola, Eagle Nest, Chimayo, Cimarron, Red River, and Ranchos de Taos. So come discover a pet friendly Northern New Mexico Ski Country vacation! The regions world-class skiing, stunning landscape, and abundance of pet friendly activities combined with small crowds, affordable prices, and laid-back atmosphere will make this a trip pet owners will never forget. Start packing the skis and golf clubs today and don't forget to bring your pet! Use the search engine above to find the towns of villages of this region and there you will find listings for accommodations and other places where your pet will be welcome. Finding pet friendly hotels, lodging, pet sitters, pet friendly parks and restaurants in Northern New Mexico Ski Country is easy with PetTravel.com. Just search this region in the second search box and click the SEARCH FOR PET FRIENDLY ACCOMMODATIONS button above for a list of towns and cities in this region. In each city you will find pet friendly hotels, motels, bed and breakfasts, small inns, and vacation rentals, and in many cases you can book reservations online! Find pet friendly hotels in New Mexico Ski Country.